Hamesha Der Ker Deta Hun Main Munir Niazi: (ھمیشہ دیر کر دیتا ھوں میں ) This is the most sung poem of Munir Niazi. It will not be wrong to state that he is remembered in Urdu Poetry for his this single poem. A great poem indeed. Read and enjoy the dejection of a person that feels he has never been on time in life. The gloom speaks volumes when we recite the poem and it appears that it is not Munir Niazi rather it is us that utter passionately that: “Hamesha der kar deta hun main”. 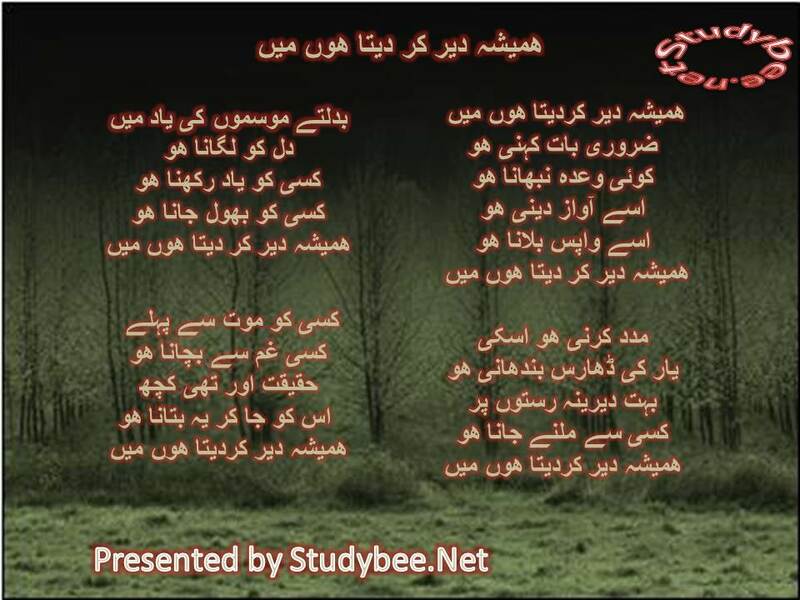 There is a picture added for the poem in pure urdu while a roman text is also placed below.